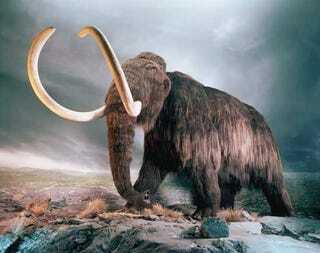 When humans migrated to the Americas roughly 13 thousand years ago, they hunted megafauna like mammoths to extinction. The result? Scientists say that without giant animal farts, there was a massive depletion in atmospheric methane, possibly causing an ice age. Over the weekend, a group of researchers published in Nature Geoscience the results of a study on climate change during the millennia after humans came to the New World, in the late Pleistocene about 13,000 years ago. When humans arrived in what later became the Americas, they hunted the giant woolly mammoths and mastodons to extinction - by 11,500 years ago, 80 percent of the mammoths and mastodons were gone. And that was roughly around the same time that the mini ice age called the Younger Dryas hit. Temperatures dropped an estimated 9-12 degrees C.
Above, you can see a rough timeline of of these events, with the Y axis representing methane concentrations in the air, and the X axis showing thousands of years before the present. As you can see, human settlements (associated with the "Clovis artefacts," or tools) came before the extinction event, which precipitated the ice age. After examining ice cores that contain atmospheric particulates from these eras, researchers discovered a precipitous decline in methane before the ice age, which they estimate might be entirely caused by the extinction of the megafauna. These creatures' digestive cycles, like that of cows today, was pumping a lot of methane into the atmosphere. In fact, these megafauna were probably responsible for creating roughly 20% of atmospheric methane. What this means is that humans have been affecting climate change for millennia. But it also suggests a grisly solution to our current climate change problems. If we killed off cows the way our ancestors killed off megafauna, could we counteract global warming?